King, Betty Nygaard. "Ottawa Redblacks". The Canadian Encyclopedia, 26 November 2018, Historica Canada. https://www.thecanadianencyclopedia.ca/en/article/ottawa-redblacks. Accessed 20 April 2019. The Ottawa Redblacks are a Canadian Football League (CFL) franchise located in Ottawa, Ontario. The team was founded in 2010 and began playing in 2014, with their first home game at TD Place Stadium. The Redblacks won the Grey Cup in 2016, their third season. Travon Van of the Ottawa Redblacks during a pre-season game against the Winnipeg Blue Bombers at TD Place in Ottawa, 13 June 2016. Football in Ottawa dates back to the 1800s, with amateur and professional teams variously named the Ottawa Football Club (1876–97), the Ottawa Rough Riders (1898–1924) and the Senators (1925–30). In 1931, the Senators resumed the Rough Riders name, and the team enjoyed many successful seasons until disbanding after the 1996 season. A later CFL team, the Ottawa Renegades, played from 2002 to 2005 but folded in 2006, leaving the nation’s capital without a CFL team. The Ottawa Sports and Entertainment Group (OSEG) was founded with the goal of bringing professional football back to Ottawa. Partners Jeff Hunt, Roger Greenberg, John Pugh, John Ruddy and Bill Shenkman provided local financial support (in contrast to the long-distance ownership that hampered the Ottawa Rough Riders and Renegades). In March 2008, the CFL announced that it had conditionally awarded a franchise for a new team, ushering in a new era of football for Ottawa. The plans for the new team involved a major redevelopment of Lansdowne Park and Frank Clair Stadium, where earlier Ottawa teams had played. In 2012, the Ottawa City Council approved the OSEG’s $300 million redevelopment plan. The 48-acre Lansdowne Park was rebuilt as a sports, retail and entertainment destination, while the renamed TD Place Stadium, home of the new football and soccer teams, was rebuilt with 24,656 seats. After inviting suggestions from the public, the owners chose Ottawa Redblacks (in French, Rouge et Noir d’Ottawa) as the team’s name. The name refers to the team’s uniform colours of red, black, and white, which honour those of the earlier Ottawa Rough Riders and Renegades. The Redblacks logo is a saw blade, recalling Ottawa’s history as a lumber town. The Ottawa Fury soccer club play Rayo Oklahoma at TD Place Stadium in Ottawa, 10 July 2016. In 2013, the Redblacks appointed general manager Marcel Desjardins and head coach Rick Campbell and, soon after, signed starting quarterback Henry Burris. The Redblacks played their inaugural regular-season game on 3 July 2014 in Winnipeg, losing 36–28. 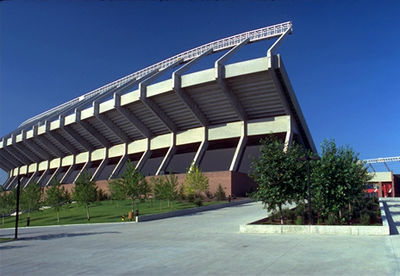 Their first home game followed on 18 July against the Toronto Argonauts before a sellout crowd at TD Place Stadium, where the Redblacks posted their first win, 18–17. Sellout attendance continued for the next two seasons, with crowds averaging more than 24,000 fans at home games. The Redblacks won only two games in 2014, both at home, and finished last in the league with a 2–16 win-loss record. The team scored 278 points and 27 touchdowns and earned 5,400 net yards, 1,484 of them rushing. Chevon Walker was the team’s leading rusher, and Marcus Henry was the leading receiver. The tide turned for the Redblacks during their second season, when they won 12 regular-season games, scored 464 points and finished first in the East Division. Highlights of 2015 included the unusual relocation of the 6 October game from Toronto to Ottawa due to the Pan American Games in Toronto. Four Redblacks receivers finished the season with over 1,000 yards, and the team led the CFL with 5,816 passing yards and 61 sacks. Jeremiah Johnson was the team’s leading rusher with 448 yards, and Chris Williams was the leading receiver. Henry Burris, Jon Gott and Abdul Kanneh were named CFL 2015 All-Stars, and several other players were East Division All-Stars. On 22 November, the Redblacks defeated the Hamilton Tiger-Cats in the 2015 East Division playoff final in Ottawa. Ottawa clinched the win with a thrilling play that became known as “the Miracle on Bank Street.” Late in the game, on a vital second down with 25 yards to go, Burris threw a 42-yard pass to wide receiver Greg Ellingson, who ran it into the end zone for a touchdown (a 93-yard play in total). With a final score of 35–28, the Redblacks became the CFL East Division champions in just their second year of operation. The following week, on 29 November, the Redblacks contested their first Grey Cup game, losing 26–20 to the Edmonton Eskimos. An Ottawa team hadn’t played in the Grey Cup since the Ottawa Rough Riders in 1981. At the 2015 year-end CFL Awards, Redblacks head coach Rick Campbell was named Coach of the Year. Burris was named Most Outstanding Player, receiver Brad Sinopoli was named Most Outstanding Canadian, and SirVincent Rogers was named Most Outstanding Offensive Lineman. The Redblacks began the 2016 season with three wins and one tie over the first four games. Their season opener was played on 25 June in a Grey Cup rematch in Edmonton, with Ottawa winning 45–37 in overtime. The acquisition of backup quarterback Trevor Harris proved key when Burris injured his hand and Harris took over with great success for several games. When Harris himself was injured, the recovered Burris returned for the remainder of the season. By the end of the season, the Redblacks had recorded eight wins, nine losses and one tie, enough for first place in the East Division for the second consecutive year, having scored 486 points with a net offence of 7,466 yards. Four receivers — Greg Ellingson, Chris Williams, Ernest Jackson and Brad Sinopoli — attained 1,000-yard seasons in two successive years, which was a CFL record. Mossis Madu was the team’s top rusher, and Damaso Munoz was the leading tackler. The East Division playoff game — a rare crossover game against the West Division’s Edmonton Eskimos — was played at TD Place Stadium in Ottawa on 20 November in a snowstorm. Edmonton had crossed over to the East Division for the playoffs and defeated the Hamilton Tiger-Cats in the semifinal. (Crossover games happen when the fourth-place team in one division ends the season with more points than the other division’s third-place team. In such a case, the team with the higher points crosses over to the other division, replacing the third-place team and playing the second-place team in the playoff semifinal.) The Redblacks defeated Edmonton 35–23, advancing to the Grey Cup game for the second straight year. The 104th Grey Cup was played on 27 November 2016 in Toronto. It was a David-meets-Goliath contest, pitting the Redblacks against the heavily favoured Calgary Stampeders. Defying expectations, the underdog Redblacks won in overtime (only the third time a Grey Cup game has gone into overtime) by a score of 39–33. It was Ottawa’s first Grey Cup win since 1976. Henry Burris retired after the 2016 Grey Cup, and Trevor Harris became the Redblacks’ starting quarterback for the 2017 season. The Redblacks finished the 2017 season in second place in the East Division with an 8–9–1 record, but lost 20–31 to the Saskatchewan Roughriders in the East Semi-Final. Kicker Lewis Ward proved to be the league’s feel-good story of the season. The Kingston resident, who went undrafted and was working as a security guard at the 2017 Grey Cup game in Ottawa, set a CFL record for most successful field goal attempts (51 for 52, or 98.1 per cent), and CFL and pro football records for most consecutive field goals (48), beating the old records of 32 and 44, respectively. 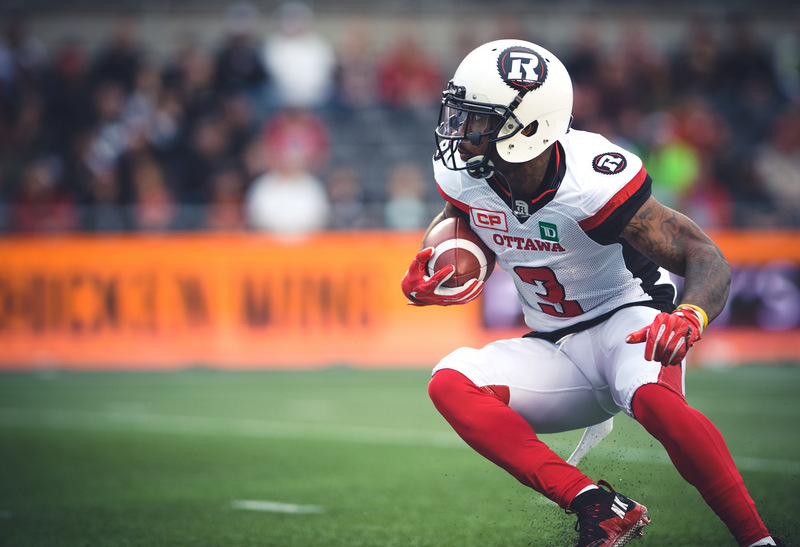 Ward was responsible for scoring 169 of the Redblacks’ 464 points during the regular season. Ward won CFL Awards for Most Outstanding Rookie and Most Outstanding Special Teams Player — the first kicker ever to win the latter. Redblacks’ receiver Brad Sinopoli set a single-season CFL record for most receptions by a Canadian (116) and was named the league’s Most Outstanding Canadian Player for the second time. Ottawa finished the 2018 season in first place in the East with an 11–7 record. They handily defeated the Hamilton Tiger-Cats in the East Final by a score of 46–27, and quarterback Trevor Harris set a CFL playoff record by passing for six touchdowns in the game. The Redblacks earned their third Grey Cup berth in four seasons. However, in the 106th Grey Cup game in Edmonton, Ottawa lost 16–27 to the Calgary Stampeders. Brent Dowdall, Turnover: The Fumbling of the Ottawa Rough Riders (1999). Stephen Brunt, 100 Grey Cups: This Is Our Game (2012).